Client is a technology company that creates software for social networking for business-to-business (B2B), business-to-consumer (B2C) and consumer-to-consumer (C2C) marketing innovations. Client is building an application where a social networking application dramatically enhances the value and economics of social networking by bringing in the world of business transactions and relationships. STPL Inc establishes best in off-shoring product development in terms of quality products, strong management skill, start-of-art development environment and strong technical skill. Project management is the key to keeping our clients, many of which have been with us for more than years. Keeping our clients up to date and constantly in touch with a project allows us to make sure all expectations are being met and helps to keep surprises to a minimum. Our project management capabilities allow us to manage resources, control project costs, deliver projects on time, and manage communication with the client. Client had developed a POC version deploying Pearl Scripts and MySql data base. Now the requirement was to migrate the application to the beta phase deploying LAMP technologies. STPL was the natural choice as STPL has the skill set ranging across multiple technologies, besides and extensive experience in Ecommerce as well as Social Networking based applications. STPL follows strict methodologies for quality assurance. All the processes and activities of design, development, implementation and maintenance of software are carried out under continuous monitoring and evaluation for accuracy and effectiveness: thus taking complete care of the quality aspect. We work closely with the customer to identify their exact needs and develop and tailor our services and solutions to ensure quality on every deliverable. STPL Inc. believes that the quality products delivered to our clients will reflect as enhanced scope of growth and opening of new horizon for us. To ensure this, we have a proper Testing and Quality team which monitors the quality of each product and enhances its scope and uses to millions of user including the disabled users. Various functionalities/modules of this Project are given below. 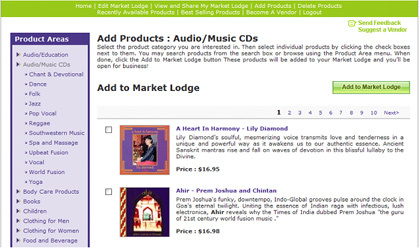 Users can create a personalized market place, filled with products that can be selected from vendors around the world. 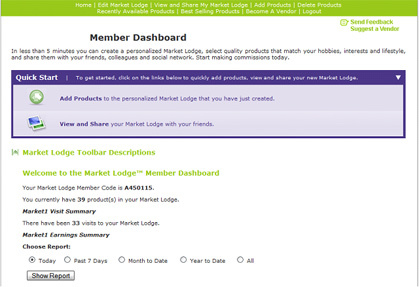 Members can share their market place with friends, relatives and colleagues –personal social network – via own Web Site and sites like Facebook, My Space, linked In and other popular social networks. Vendors of all types of products can connect with and sell to the 1.2 BILLION members of social networks. The site enables members of social networks to rapidly create personalized market places in their own online space. Members then leverage their own personal social network of friends, family and colleagues to present and sell your products. Manage Contact Information, Manage Products, Sales Reports, and Best selling products. The implementation of this shopping Application was challenging and innovative. 2. Client wanted to use the product engine of the existing site in to the new site. 3. The old code was in PERL, and client wanted to get the new code developed in PHP. 1. The change request was successfully completed by implementing the new functionality. 2. The old product engine was successfully integrated into the new site. 3. Integration of PERL code with PHP was successfully implemented.